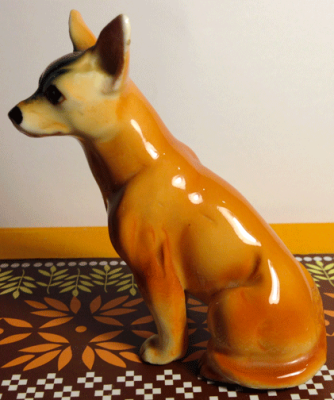 There is no maker's mark on this little china dog. 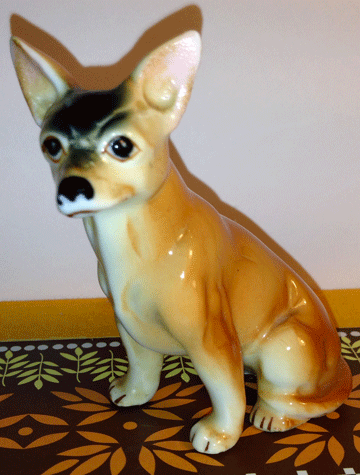 To me, it looks like a chihuahua, but it could be some sort of terrier . It has a black forehead with a white belly and is orangy-tan on the back and sides. It stands about 3 inches tall and 2.5 inches at it's widest point. It weighs 1.5 ounces. This little dog is at least 30 years old. This little mouse is made up of several types of fabric. The main body is red with a short velvety feel. The arms are made of stiff felt, the eyes are made of several layers of stiff felt and are blue in color. He has a piece of fluffy white material on his head and chest. His whiskers appear to be made of white thread, and his tail looks to be made of two long strips of red felt sewn together. The nose is also felt. The arms, eyes, nose, and fur on the head and chest appear to be glued on, the rest of the pieces are sewn. I don't believe he's ever been played with or handled much. 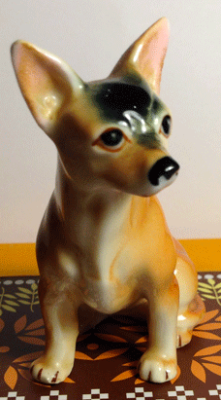 His ears show a little discoloration on the white insides. 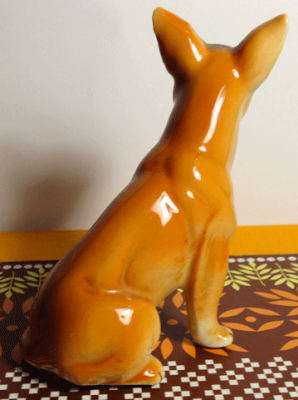 This mouse stands about 6 inches high and is about 3.5 inches wide at the base. He weighs 4.2 ounces. 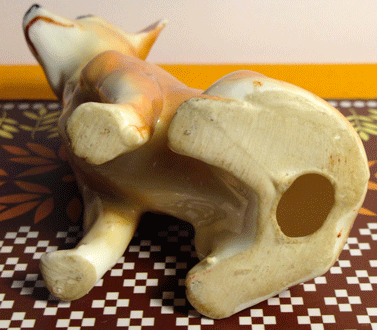 The tag attached to his body says he was made in Japan and contains sawdust. It also says Herman Pecker and Co. The front of the tag appears to be spotted with dirt. The tag around his ear has a picture of a woodpecker on one side. The other side has a stamp that says 1955. 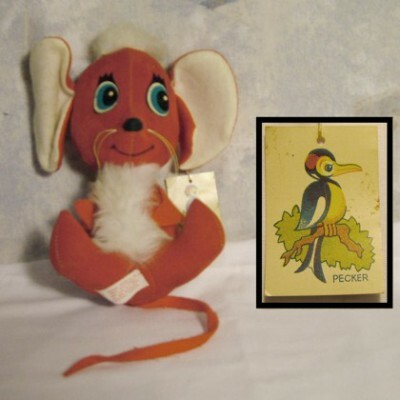 Below that, it says the mouse was made by Herman Pecker and Co. Inc. This mouse is at least 30 years old. If it was made in 1955, then it is 60 years old. That's an old mouse!